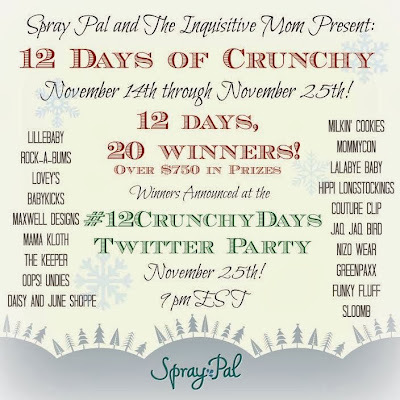 I’m joining Spray Pal and The Inquisitive Mom November 14th through the 25th for the 12 Days of Crunchy Event (Enter and RSVP for the twitter part using this link)! Each day leading up to the twitter party, a new blogger will share the details of that day’s prize and reveal a new entry for the day. I’m excited to share today’s prizes, which include a Maxwell Designs Grab N Go and a Lovey’s Tushi Wash and Tushi Stick! 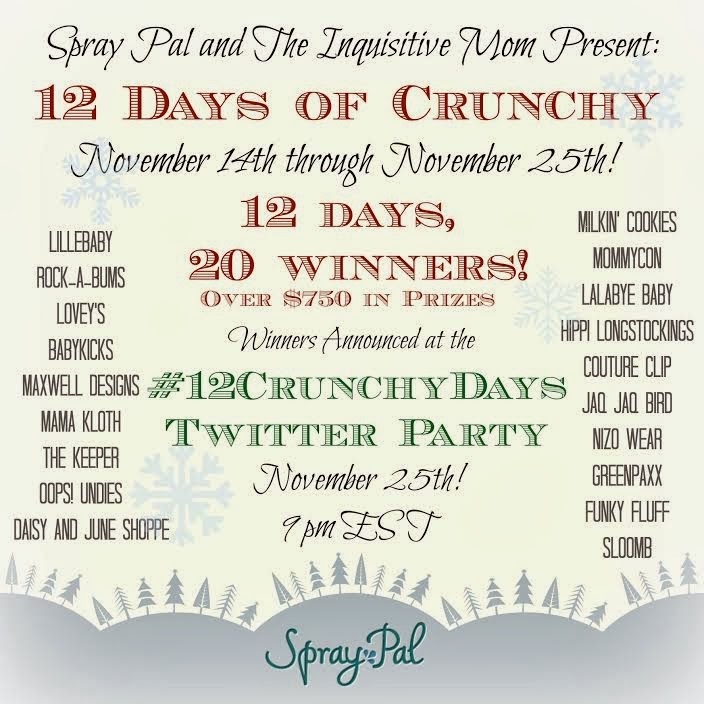 Be sure to enter to win and RSVP here for the #12CrunchyDays Twitter Party! You can also grab daily entries here by filling out the entry form below. Maxwell Designs is Canada’s leading designer of functional, handcrafted accessories for the modern mom. Maggie, the designer behind Maxwell Designs, began designing bags after the birth of her first son, Maxwell. She couldn’t find a functional diaper bag that featured sophisticated prints and quality fabrics, so she decided to design her own. Since that time, Maggie has continually listened to customer’s needs and wants and continually challenged herself to create products that are multi-functional, stylish, and practical. Mindy at The Inquisitive Mom loves her multi-functional Maxwell Designs products! Lovey’s began with a mother’s love for her baby and a passion for healthy living. The mom behind Lovey’s became frustrated with the lack of natural diaper rash treatments and, after months of trying different formulas without success, she decided to create her own with good quality, natural ingredients and Tushi Wash was born. and are proudly made in Canada.